Critical Defense® Lite™ 9mm Luger is an effective, reduced recoil option for ANY shooter looking to minimize the felt recoil of their lightweight, compact personal protection handgun. The 9mm Critical Defense® Lite™ load features a 27% reduction in recoil compared to standard loads and provides 10” of penetration in ballistic gelatin through heavy clothing. Designed with the same proven components as our Critical Defense® line of ammunition, this offering features a 100 grain FTX® bullet with a unique PINK Flex Tip®! 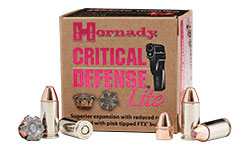 The pink bullet tips and pink ribbon packaging help signify that a portion of the proceeds from the sale of Critical Defense® Lite™ will go to help fund breast cancer research. PINK Flex Tip® - portion of the proceeds go to help fund breast cancer research. You must be 18 or older to order ammunition. Ammunition must ship UPS ground. Due to Department of Transportation regulations, we cannot accept returns on Ammunition. Make sure to use the correct ammunition in your gun. Check local laws before ordering.Attention!